In this episode of BizCraft Carl and Gene talk Rob Harr of Sparkbox about how they price projects, company culture and other various business opinions – which Rob has plenty of! In this episode of BizCraft Carl and Gene talk about the time someone at Apple sent a not-so-funny joke to someone at nGen Works. 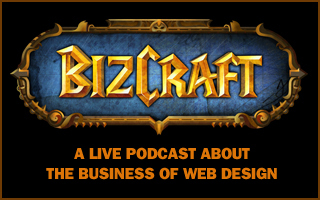 In this episode of BizCraft Carl and Gene talk with the fine gentlemen of The Dirt podcast about the death of originality in web design, commoditization of the low end of our market, the actual starting time of beer ‘o’ clock in Florida, and how our profession has responded to a proliferation of high quality and cheap design options. In this episode of BizCraft Carl and Gene talk about managing your time on a life level, saying no to things and how to get things going. In this episode of BizCraft Carl and Gene talk about doing your best work and being a great person and dealing with people you work with. In this episode of BizCraft Carl and Gene get into personal core values that drive their personal, professional and business goals.